I’ve never seen TSB Arena set up with carpet tiles. I guess most of the time I’m watching rock bands and the bogans spill beer all over the floor, but still, it added a slight air of classiness to the night. Kimbra seemed a suitable choice as opener tonight. Quirky, and very percussion-based, her unique brand of pop shares many commonalities with Byrne’s. Kimbra stood centre stage, fitted out in a glittery caped outfit that Rob Halford would be proud of. She was flanked by two other musos, mostly playing synth, but using a number of other instruments too. The mix sounded muddy, with excessive focus on the low-end, which sadly made Kimbra’s voice harder to hear. I didn’t enjoy it to start with, but towards the end of her set things started to improve. On of the key figures in the CBGB’s scene – a New York club from whence the seeds of punk and new-wave grew – David Byrne came to prominence fronting Talking Heads, which in turn provided a springboard for his solo music career. Tonight drew heavily from his recent album American Utopia, with a few covers and Talking Heads numbers thrown in for good measure. In a live setting there are bands that play music, and bands that put on a show. There was never any doubt that Byrne falls into the later category. Byrne sat on a chair at a solitary desk situated centre stage. Stark lighting illuminated draped strings that hung around the perimeter of the stage, acting as curtains that could easily be passed through at any point. He held a fake brain up as a prop, pointing to different sections as he sung his song “Here”. Screens either side of the stage showed this from a bird’s-eye perspective, giving an oddly surreal feel. He wore a crisp all-grey suit, with all three blazer buttons done up. But his bare feet and shock of thick white hair gave the impression of someone slightly eccentric. Although how small is the divide between eccentric and genius? Some band members came on stage to join him, a couple backing singers, a keyboard player, guitar and bass. They all dressed uniform: barefoot in grey suits. This is when things started to get impressive. The music was captivating, but all the performers danced and moved around in sync. Hats off to the choreographer, and to the performers who had to memorize and execute the nearly two-hour long set most nights. It was infectious too. The entire event was seated, with no general admission option, but you could see by the third song that a mass migration was well underway, with punters abandoning their allocated seats for dancing space within the aisles. It makes me wonder why they even bothered setting up chairs in the first place, knowing the kind of music Byrne would play. There were 12 musicians in total. Some had distinct roles – like the singers and keyboardist, but many changed instruments depending on the song. And did I mention that they all moved about the stage? That’s right: no stationary drum sets, no keyboards on stands; everyone danced about the stage and played flawlessly while they were mobile. Byrne himself took to guitar on a few songs too. I can’t even name all the instruments I saw. There were lots of drums and percussive instruments. The final song featured melodica solos. And it was all live. Byrne explained that although many people suspect backing tracks and samples, everything was coming from the 12 people onstage or in the wings. It was hard to believe, but he broke down one track, allowing us to see for ourselves as each musician began to join in sequentially. The stage set-up changed slightly for each song. Usually it was all under stark white lighting, but they made use of spotlights and shadows to highlight certain elements. My favourite effect was a harsh floodlight at the front of the stage projecting shadows of the players against the rear wall. The musicians would march on and off stage at certain points, providing visual dynamics to match the wonderful music. As you can guess, some of the songs that garnered the best reaction from the crowd were the bigger Talking Heads hits, such as “Once In A Lifetime”, “Road To Nowhere” and “Burning Down The House”. One of the best songs took me by surprise though. I had expected them to close with “Psycho Killer”, on of the more iconic Talking Heads songs. Instead, they finished the night with an electrifying cover of called “Hell You Talmbout”. Byrne explained that he’d seen Janelle Monáe play it at the 2015 Women’s March, and had become completely taken with the song. And I can see why. First of all, it made use of the many talented percussionists and drummers in the band, providing a compelling primal energy. Secondly, the political content provided a righteous anger to help everyone get fired up. And finally, it is repetitive, which helped everyone fall under the spell of the infectious groove. What an incredibly powerful song. It was a sensational night. Fantastic music, impressive showmanship, great stage set up, brimming with fun energy, and completely original. Byrne demonstrated exactly why he’s managed to have such a long and critically acclaimed career. If you get the chance to see this show, do not miss it! The lead up to Jim Beam Homegrown has been interesting to observe. Tickets sold out about a week ago, prompting a frenzy of online ticket on-selling. An influx of first-year university students had just come down from their collective O-week high and decided that the cure was to attend Homegrown, no matter what it costs (Thanks Studylink!). Tickets that had originally sold for $109+bf were fetching $250. One girl even paid $700 for two! Then the weather hit. The festival was postponed from Saturday to Sunday in light of predicted hurricane strength winds. Most visitors from out-of-town had return travel booked for Sunday, so suddenly couldn’t make the event. On top of that were locals who for whatever reason couldn’t escape Sunday commitments. Cue another ticket frenzy, with people desperate to get whatever they could for tickets that they were unable to use. I’m sure that hundreds went unused. Ticketing agencies refused refunds, citing terms and conditions. A postponed event is different to a cancelled event, and they can’t help it if someone is unfortunate enough not to be able to make it. As a consolation, Homegrown organised two shows at TSB Arena on Saturday for those who couldn’t attend on Sunday. There was an early afternoon rock show featuring Villany, I Am Giant, Devilskin and Blacklistt. A later evening show featured rapper David Dallas, dub-rockers Kora, rock heavyweights Shihad and drum and bass favourites Shapeshifter. Out-of-towners could choose one of the Saturday shows to attend. 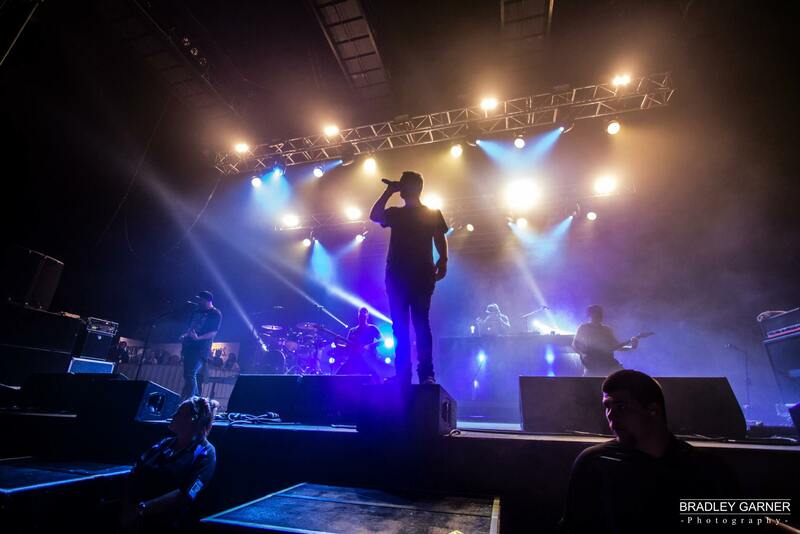 Seeing only four bands may have felt like a raw deal, but it was better than nothing. Not enough people showed up though, so Homegrown organisers allowed local ticket holders to attend as well, to fill up the venue. On Sunday morning the weather was stunning. Still, bright and warm: the perfect recipe to ensure that thousands of drunken concertgoers get their generous dose of sunburn. There was no evidence to indicate the lightning, floods and gale winds of the previous day. The Wellington waterfront was already alive with activity due to the weekly vege markets, and steadily got busier as punters arrived for the festival. Lining up to swap tickets for wristbands was surprisingly painless. No half hour queues like I’d seen in previous years. 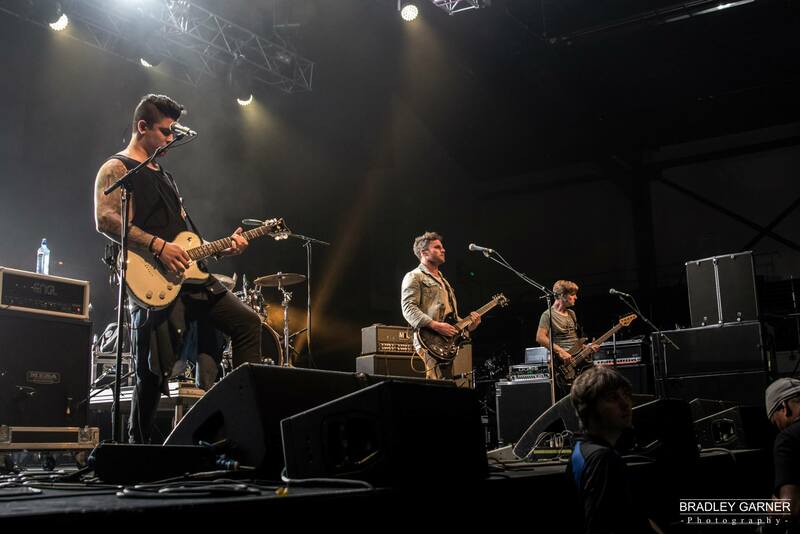 The first band I saw was Silence The City on the rock stage in TSB Arena. The day was still young so there wasn’t much of a crowd gathered in front of the stage. They played a short set of alt rock, complete with blinding strobe flashes at regular intervals. A few songs have got airtime on the radio recently and the crowd reacted well to those, along with a cover of Ellie Goulding’s “Burn”, that was quite different to last time I’d seen it played. It seems that most shows have a standout member of the audience (like Amelia, the blonde girl at Dragonforce a few weeks ago). Well the star of the day at Homegrown was the bare-chested dancer at the rock stage. He was a bearded man with long hair and an open denim shirt who was tearing up the dance floor as if he owned it. He was effortlessly elegant and graceful as he strutted and twirled. The way he moved his feet was especially impressive, seeing as how the floor was so disgustingly sticky from all the spilled drinks the night before. I found myself spending more time watching his dancing than watching the band.I’d seen this same man at Westfest the previous week, dressed and dancing exactly the same during Soundgarden’s set. I like Black River Drive but I haven’t really followed them since I saw them about five years ago, when they were promoting Perfect Flaws. They have a nice light rock sound that still retains an edge. I noticed that they have a new drummer now, but still sound largely the same. It made for nice listening as I watched our nameless dancer friend boogie his day away at the back of the arena. BRD also get bonus points for having a bubble machine onstage. Black River Drive. Image: Bradley Garner Photography. Nothing scheduled for the next few hours was of interest, so my friends and I took some time to rest up for the night ahead. We bought some ice creams that melted almost instantly in the heat, and made sure to drink plenty of water. Come 7pm I made my one foray away from the rock stage to the Pop and R&B stage for South Auckland rapper David Dallas. It certainly was a different crowd. Gone were the seas of black band t-shirts and heavily tattooed limbs, although there were plenty of #makehistory temporary tattoos that the Jim Beam girls had given out all day. Dallas’s band, The Daylight Robbery, were absent due to Homegrown having been postponed. But this didn’t stop Dallas delivering a hit-heavy set. With a DJ manning the backing tracks, Dallas and long time collaborator Jordache tag teamed and performed songs from throughout Dallas’s entire career. If anything, losing his band let Dallas mix things up more. Sid Diamond joined him onstage for “Southside”, followed by another guest spot from PNC. Dallas was right at home onstage and he knew it. He smiled coyly and beckoned for more applause. He rapped a few pre-intro verses before finishing his set with “Runnin'”. It’s true: Not many can rock a show like this. After wolfing down a burger and a punnet of chips we ventured back to the rock stage for rest of the night. Blacklistt. Image: Bradley Garner Photography. Front-man Damien Alexander started off the set with a vicious rap, before Blacklistt gave their typically aggressive performance for the hard rock fans. They played to please, from the Blindspott stuff that we all wanted to hear to the newer Blacklistt songs that became the next step for the band. The reality is that Blindspott/Blacklistt are one and the same, save for legal dramas. Both have the syncopated beats, the pent-up anger, the DJ scratches, the high-pitched guitars, the reggae ballads… all those aspects that make up the overall sound. One interesting moment was when a chant started up between songs mid set, with half the crowd shouting “Blacklistt”, and the others chanting “Blindspott”. Without being formulaic, the show was everything I’ve come to expect from the band – no matter what you choose to call them. Shihad. Image: Bradley Garner Photography. 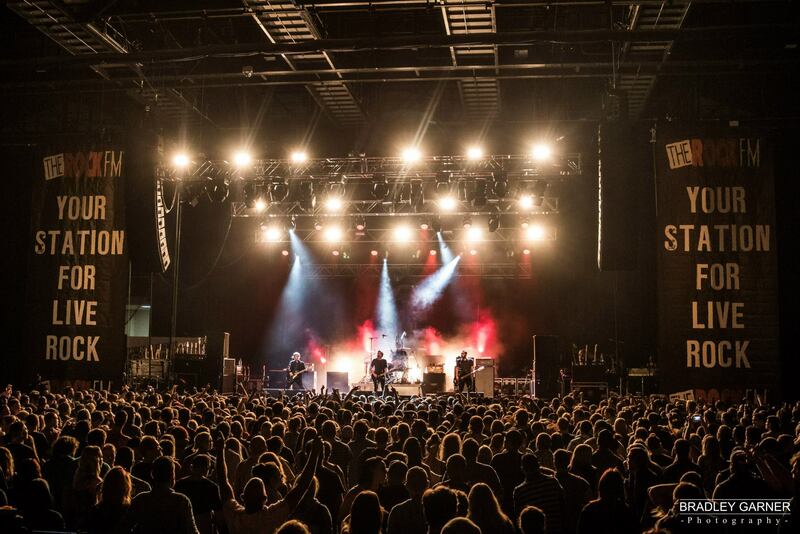 I first saw Shihad play in 2008, at the first Homegrown festival when I was 16. Tonight was the twelfth time watching them play. And there’s a reason I keep coming back. Shihad are rock legends, veterans of the stage who have played together for longer than I’ve been alive. They play every show with such energy that the audience can’t help but become infected by it. The way that front-man Jon Toogood punches the air with such force, and keeps the roadies panicking by climbing atop the speakers side of stage. The way the Karl Kippenberger plucks those bass strings in a way that you can’t help but move to. They way that Tom Larkin pummels those tight tribal patterns out of the drum skins. And although Phil Knight is the least showy, his guitar playing is vital for filling out the band’s sound. When the four of them play Wellington together, they make sure every time that it’s a homecoming to remember. I actually watched Shihad play the same set the night beforehand. A large majority of the songs played were from the latest album FVEY, with their throbbing beats and abrasive riffs. Four were from The General Electric. The one hiccup was that Knights guitar sounded like it was tuned differently for “Home Again” on the Saturday night, something that was quickly remedied just after the bridge. I think this is the sign of a great live band, that I’d be more than happy to watch the same show two nights running, and not feel bored. 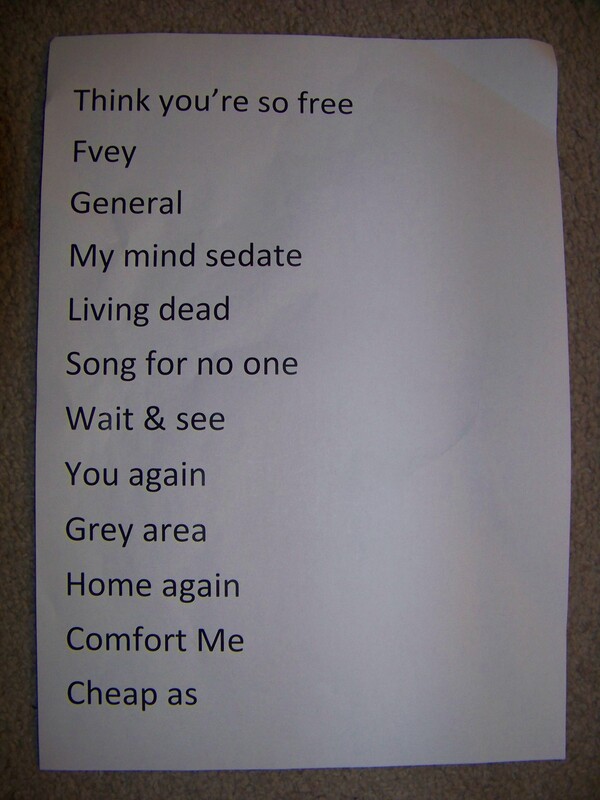 The set that Shihad played both nights. They also played the song “Pacifier” for the encore on Sunday. When I was a teenager my friends and I would road trip from our hometown of Nelson up to Wellington to attend Homegrown each year. After seven years I’ve already seen most of the bands on the lineup that I’m interested in multiple times. Even so, it still always proves to be a lot of fun. It’s easier now that I live in Wellington, and the lineup never varies much, but I can see myself happily attending more Homegrown festivals in years to come. Brother/sister duo Broods proved to be an ideal choice as tonight’s opening act. It was a homecoming of sorts for the two, who, along with their drummer, played a half hour set of sparse synth based music that complemented Goulding’s electropop brilliantly. Although the sampling sounded a bit weak to start with, once the mix improved they played a suitably dynamic set. Broods is quite a departure from the siblings’ previous band, The Peasants, and judging from crowd reaction they could well follow down the path just recently paved by Lorde. If Broods gave a taste then Goulding gave the full combo deal, demonstrating how well the style of music can be played with a full band. Goulding herself proved adept on both guitar and drums, showing her to be more than just a pretty voice that can gyrate across a stage. She started off strong with hits like ‘Figure 8’ and ‘Starry Eyed’ before changing down a gear to a stripped back song. She then stripped it back even more for a short acoustic set of songs with just guitar or piano for accompaniment. An Elton John cover preceded a lull in the set but the pace picked back up eventually, providing more opportunities for the crowd to move about. From there on in it got better and better, with Goulding appearing more comfortable to “be silly” onstage, as she told us in her polite English accent. The audience in turn seemed to receive each song better than the last, until the band finally concluded with the song ‘Burn’. This is one of the better setups I’ve seen at this venue. The stands at the rear were set up, making the arena appear fuller. The lights and screens were impressive. Goulding had the goods. Enjoyable and diverse, she demonstrated that an excellent concert can be put on without the overly excessive price of admission that her popstar contemporaries charge. She has the voice, the charisma and the stage show without the diva attitude to match.